Now with that title you could suppose that I might be talking about my wild kids. They have been rather ornery lately but that's not what today's post is about. As I was eating dinner I was thinking about what I wanted to shoot today. I could have taken a picture of my brother and his fiance at their shower but I didn't take the camera. I could have taken a picture of the boys in the tub but there weren't any bubbles. We were just about to sit down to read our scriptures for the day and I saw something weird out the back window. The first thought I had was ostrich. I knew that wasn't right. I looked again and it was a wild turkey. 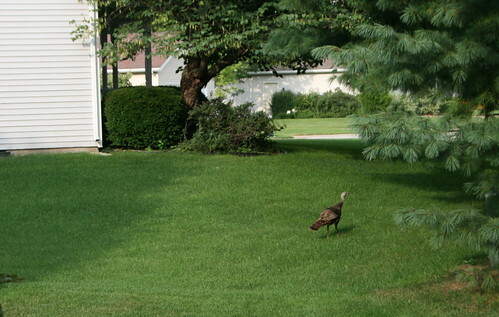 I grabbed the camera and shouted "There's a turkey in the yard!" Everyone ran to the window to look out. I opened the door as quietly as I could but that thing took off. This was the best I could get. I think the turkey is faster than a goose, at least on feet.